One of the many highlights of today was to welcome the Team 2015 Battle Bus, bringing 70 activists from London to assist Kelly's campaign. Their commitment, energy and enthusiasm was amazing and I look forward to their next visit. It was also an honour to welcome Party Chairman Grant Shapps MP with Stephen Hammond MP (Wimbledon) as well as National Vice President Steve Bell, who all arrived with the bus. Having arranged everyone for the team photo it was suggested that Steve Bell and I join the group. "Where should the ugly duo stand?" asked Steve. "I think the uglies should stand at this end," I said - slotting in at the end of the second row with Steve alongside me. I was, of course, replying to Steve's comment and what I said was meant to be self deprecating. Unfortunately, the far from ugly lady standing next to me had only heard my part of the conversation and understandably took umbrage. "Charming", she said, bristling with anger. Stupidly I tried to explain, but as hard as I tried the worse I made it, and the more I blushed and stumbled. The situation was not helped by Bell muttering "you've done it now" under his breath, obviously delighting in my predicament. Having enjoyed a bit of fun at the expense of a colleague last night, I suspect this is karma. However, in the hope that the lady with long auburn hair who I inadvertently offended is reading this blog, I thought I should at least try to explain. And apologise. The Campaign Centre where I am based is also responsible for bundling and distributing literature to the other Campaign Centres in the constituency. I am grateful to a small army of volunteers who come in almost daily to help with this work. Earlier today I sent a note to a colleague to inform her that the latest leaflet was ready to collect. About an hour later I received a call to inform me that she had driven over and was waiting outside for her leaflets. Being a helpful chap I said I would bring them down on the trolley and help her load-up. In reply to this she could have said thank you, or asked if I was sure, or said that she could manage. In fact, she could have said many things. Talking about kicking a man where it hurts! 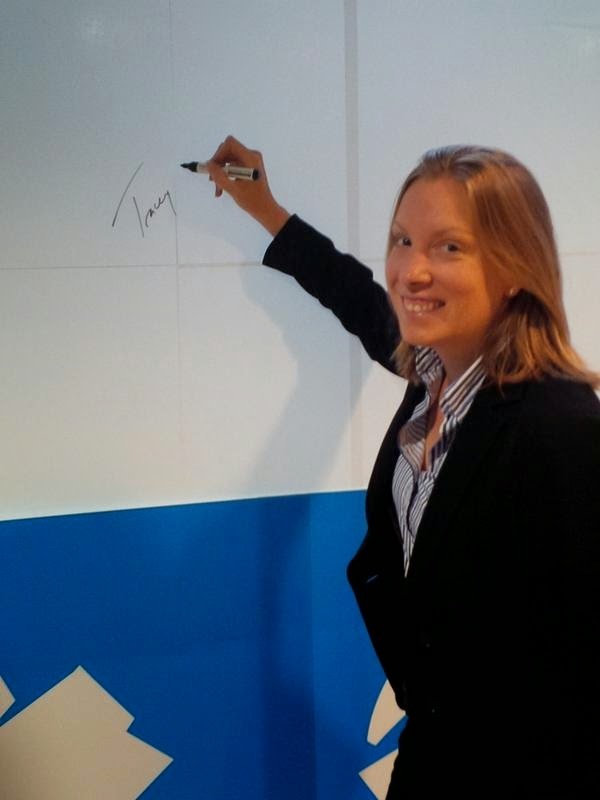 I had an impromptu lunch break today with Chatham & Aylersford MP Tracey Crouch. We were in a cafe many miles from her constituency, where she was unknown and unrecognised. At the adjoining table an elderly man was assisting his wheelchair bound wife to eat her lunch. Suddenly the lady let out a cry; her husband had accidentally knocked over a cup of coffee which had spilled over the table and was pouring onto the lady's legs. Whilst everyone around stared or in some cases laughed, quick as a flash Tracey went over to help. She mopped-up the coffee than started using wet wipes from her bag to clean the lady's legs and clothes. Having ensured the lady wasn't burnt, she then reassured the confused and agitated husband, before returning to the counter to get a replacement drink. This random act of compassion and kindness towards complete strangers, who didn't have a clue who she was and almost certainly wouldn't have a vote in her constituency, provide a real insight into Tracey's character. 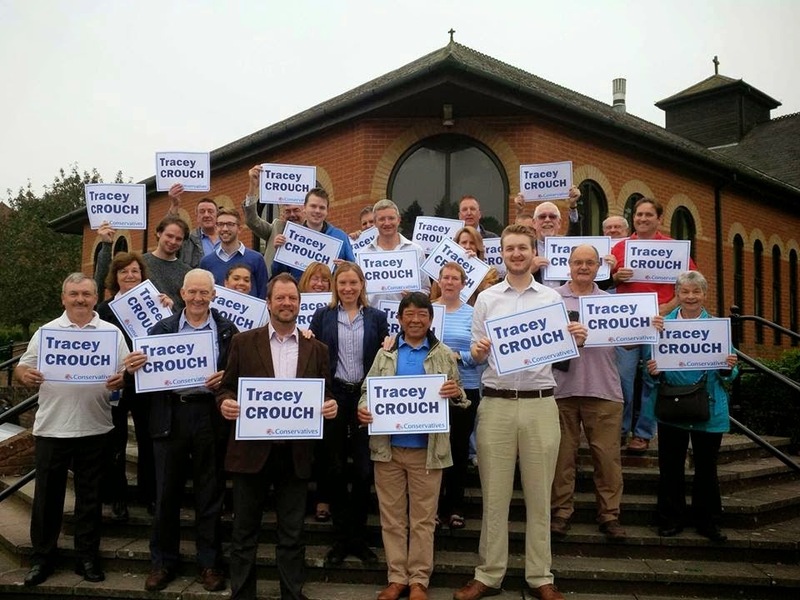 If anyone wonders why Tracey is so popular in her constituency and commands such loyalty from local members and activists, this is why. Security patrols are on the look-out for a gang of slightly eccentric people; one with a odd haircut and wearing red Dr Martens, and another short balding man with a Sarf London accent and smelling of fag smoke, who were spotted by CCTV leaving the Chatham Dockside Outlet Centre via an escalator carrying correx poster boards. A spokesperson for the board's rightful owner said, "if you see this bunch approach with extreme caution. They are essentially harmless but do have some strange habits, such as spending their weekends assaulting the ear drums of innocent residents in the Brighton, Lewes and surrounding areas." I was therefore delighted when Rochester & Strood Association agreed to hold a full Postal Primary to select their by-election candidate for the 20 November poll. My delight is two fold. Firstly as I believe it is the right thing to do. Secondly because I actually live in the constituency and will have a vote myself. 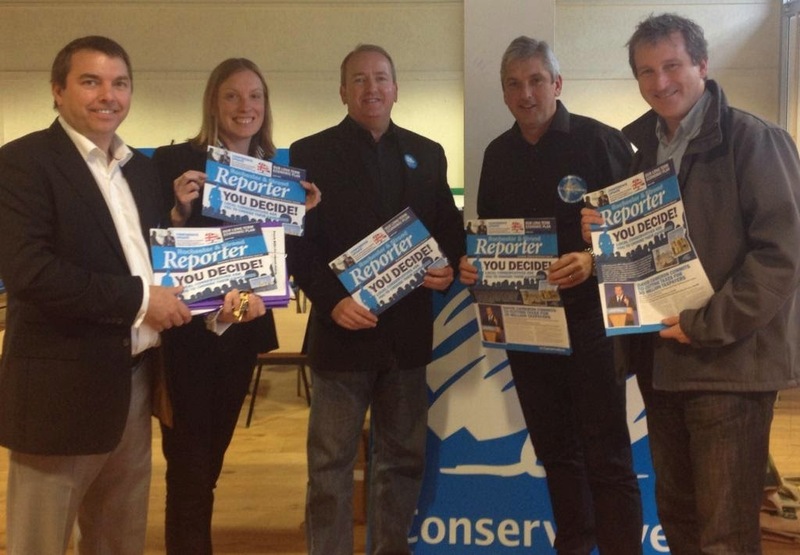 It is super to be involved in choosing who will be my local Conservative candidate and hopefully my next MP. Obviously I will be working on the campaign whichever candidate is selected so I will not be divulging which candidate I am supporting, but either would make an outstanding MP for this constituency. 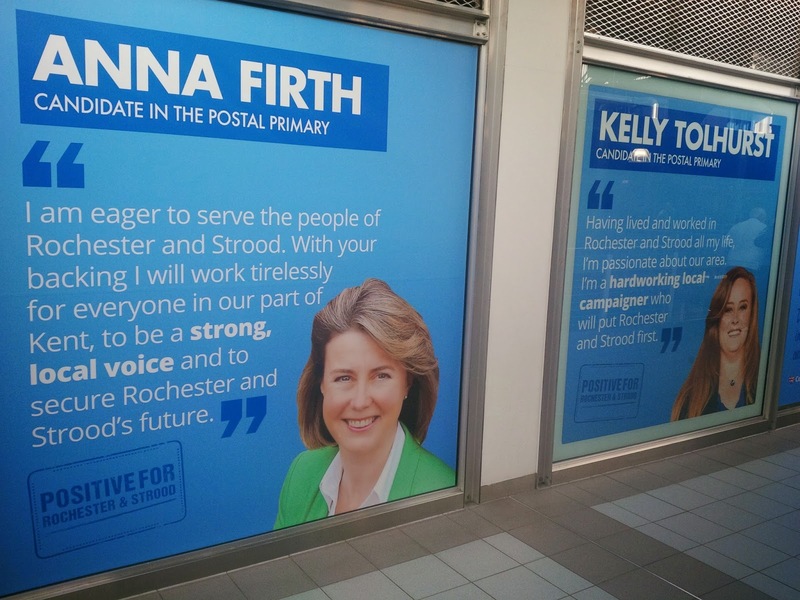 Our local Campaign HQ have been decked out promoting our Postal Primary and the final candidates - the photo below is of our Chatham Maritime Campaign HQ in the Dockside Outlet Centre. Best of luck to both candidates - you can visit their websites here: KELLY and ANNA. And if you would like a trip to sunny Rochester & Strood, please call in and say hello. 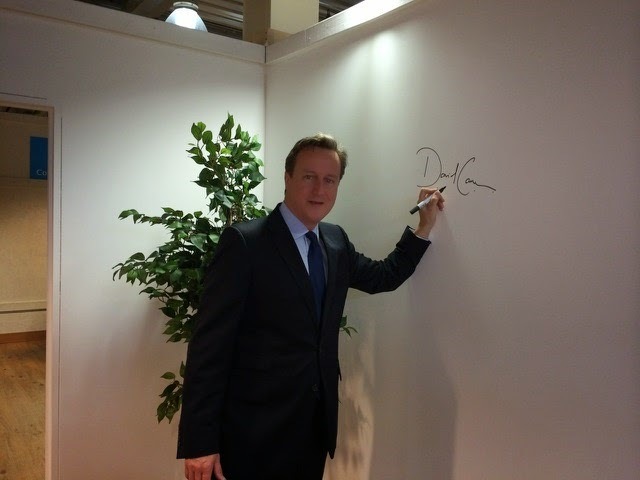 We have canvassing, we have leaflets and you might even bump into someone famous signing his name on the wall! There was a whoop of delight in West Kent Towers this afternoon when I spotted a bargain. 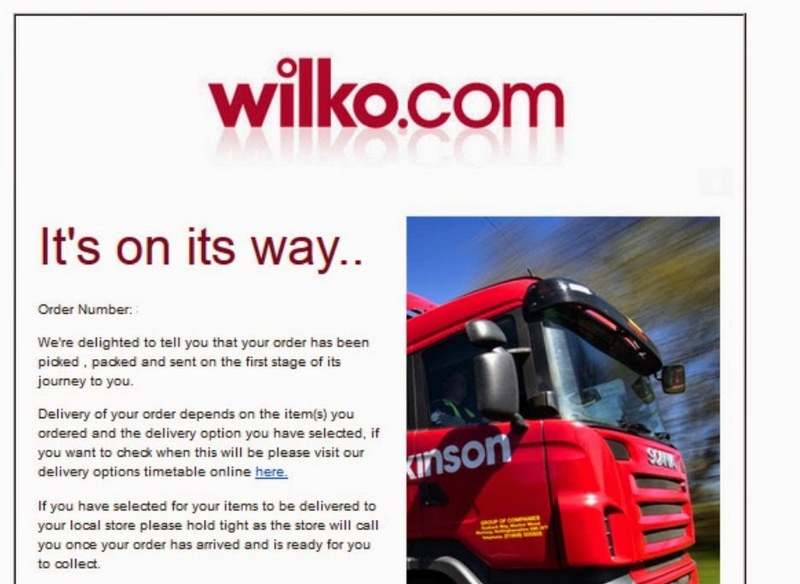 A random Google search uncovered the UKs cheapest supply of ring binders: the discount retailer Wilco. Just 40p each. Over £1 cheaper than the next cheapest I could find. If any fellow Agents or Campaign Managers are keen, I am afraid you are out lo luck. I bought their entire national stock! So come down to Kent - and you can tramp the streets with your very own Wilko-value ring binder. 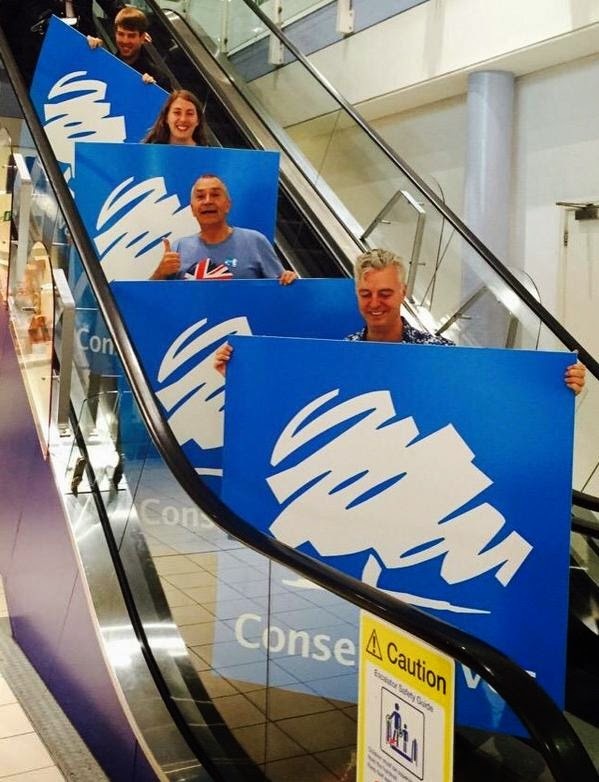 A perfect accessory for any seasoned campaigner. Matt and Jon are on stand-by. The lorry is on it;s way. It's been a long but really productive day on the campaign trail in Rochester & Strood, with a packed agenda of canvassing, leafleting and campaign activity. It was great to welcome old friends and new helpers, many of whom came from across Kent and the South East to offer support. I never cease to be amazed at the dedication of our voluntary party, who not only give up their time but also travel long distances and pay their own travel expenses to support our cause. We are very fortunate. 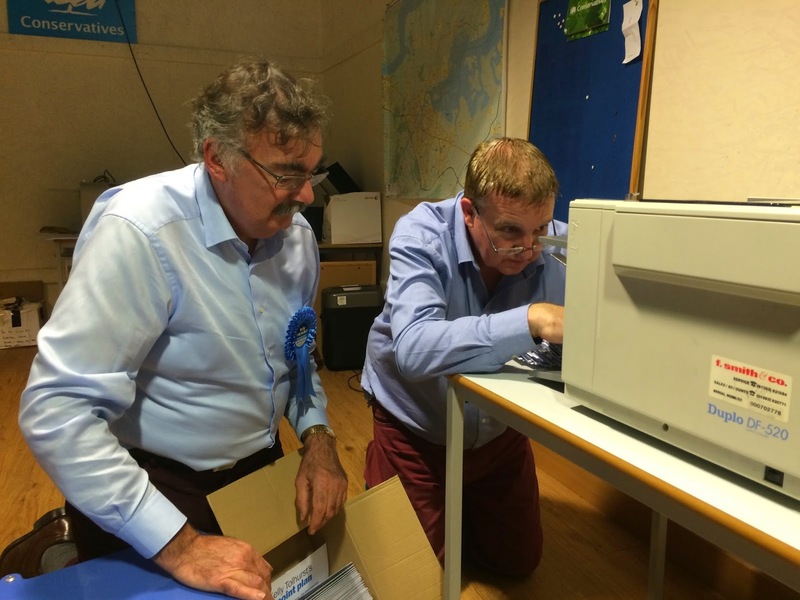 Rochester and Strood Association Chairman Andrew Mackness has emailed helpers to express his thanks. I too would like to express my thanks to all those who work with me behind the scenes to get everything ready. 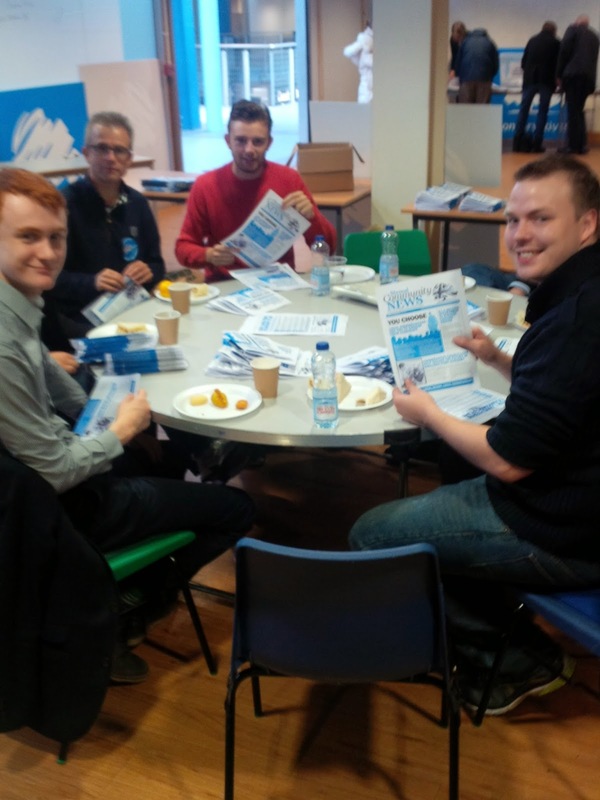 Preparing hundreds of canvassing packs with maps, directions, laminated showcards and all the other detritus of a well organised large scale campaign day is a major undertaking. As always Jon Botten and Matt Boughton have been steadfast and uncomplaining over hours of hard and tedious work, made harder this week as they were alone running the office as I had duties elsewhere. They did a super job and I am immensely grateful. As well as playing our part in the by-election we also have five Associations to run. So in addition to providing me with logistical support for what I am doing in the Medway Towns, Jon and Matt also arranged the printing and packing of five Associations-worth of Christmas Draw tickets, packed and distributed 4,000 Chatham & Aylesford Open Primary ballot papers and booklets and also sent out the Q4 membership reminders. Oh yes, and Jon got himself selected as a local government candidate in Tonbridge! My favourite independent coffee shop in Rochester High Street is owned and run by two guys who are both immigrants. One is American and his partner is French. They have lived, worked and paid taxes in this country for 20+ years. Not only do they pay their tax here, they employ people and through that employment help contribute more tax and NI to the British economy, in addition to the Corporation Tax and VAT they pay through their business. 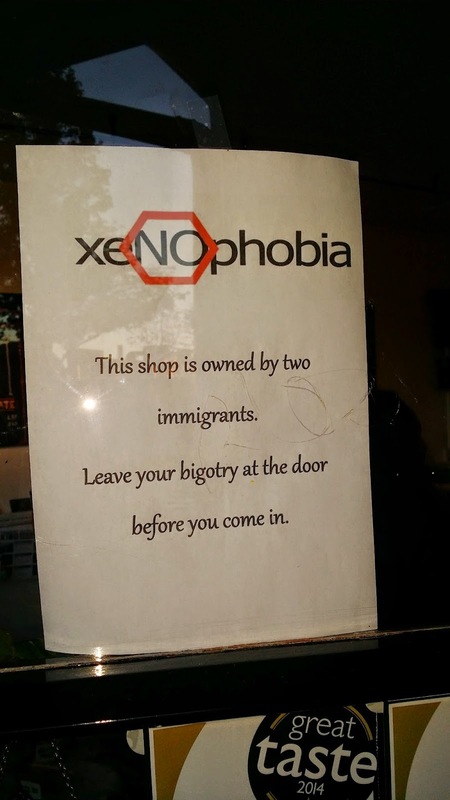 I was therefore saddened today to see they have put up this sign in their shop window. Sadly, since a certain political party opened their Campaign HQ a few doors away, there has been a significant increase in xenophobic comments and unpleasant jibes about foreigners. 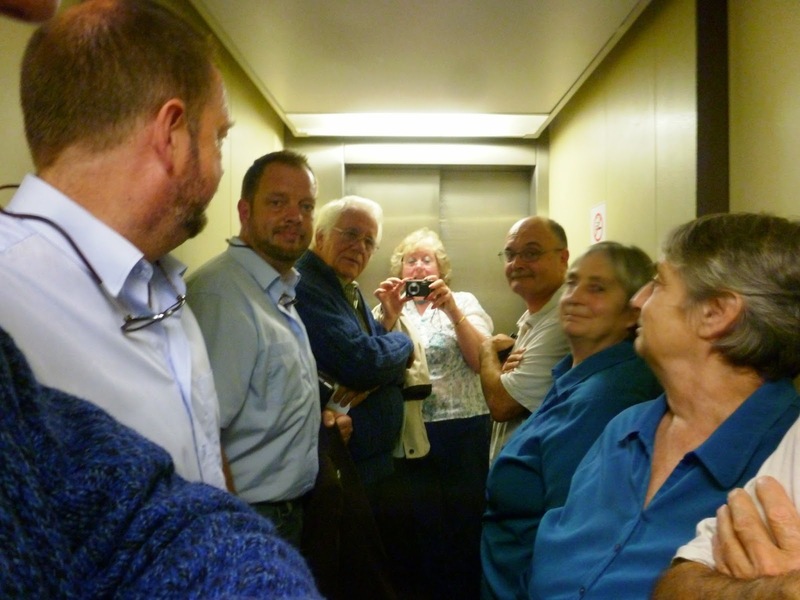 Further to last week's blogpost about our telephone canvassing team at West Kent Towers getting trapped in the broken lift, I am grateful to one of the team for sending me this photograph. Judging by their calm and unflustered demeanour I can only assume this was taken at the start and not the end of their two hour ordeal. I am pleased to report that our very own Director of Paperclips might soon be Cllr Paperclips, after his triumph of tonight's Tonbrige branch local government selection meeting. Gordon Brown may well have gone "from Stalin to Mr Bean" but he was trumped tonight by Jon Botten's own personal journey: "From Tea Boy to Trolley Dolley". Never before at a branch selection meeting has there been such a passionate display of trolley rage; he had clearly done his homework. Apparently there is a trolley dumped somewhere in the UK every 42 seconds. Retrieving abandoned trolleys cost Council Tax payers £32 million pa. And did you know, if you stacked all the abandoned trolleys end to end, the stack would be taller than Canary Wharf. So great and detailed was his knowledge I have visions of him reading past editions of "Abandoned Trolley Weekly" under the duvet with a torch. Whether any of these statistics are true, who can tell; he could have been plucking figures from thin air and saying them with such authority that no-one could possibly challenge him. I wonder where he learnt that trick! Like a demented Dale Winton on Supermarket Sweep; cometh the hour cometh the man. And this was indeed his finest hour. Judy Garland may have sung The Trolley Song but this was his own tune: The Abandoned Trolley Swansong. 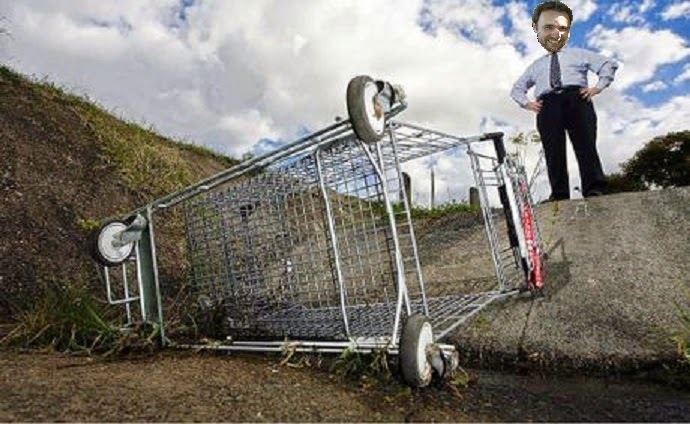 As he spoke I could see the campaign ahead; pictures of Action Team Leader Botten dragging trolleys out of the River Medway, abandoned trolley petitions and countless photographs of a miserable-faced Jon Botten pointing at abandoned trolleys like a LibDem would point at a broken lamp or pothole. 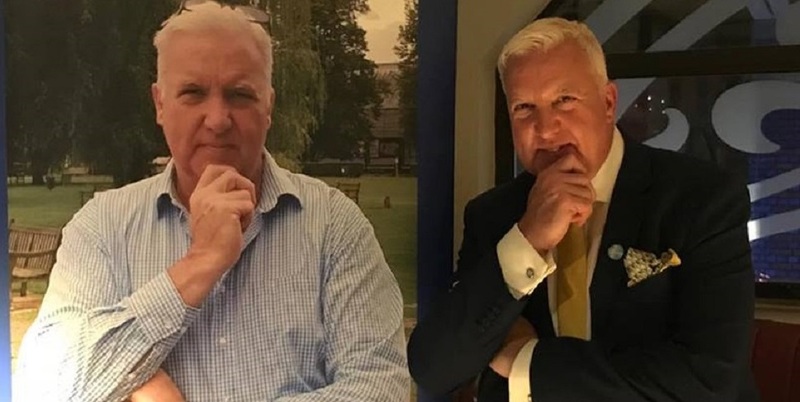 As previously blogged, Chatham & Aylesford Conservatives have agreed to trial a Postal Primary to select two local government candidates in a new ward created by a boundary review. Over the next few days every voter in the Walderslade & Aylesford North ward will receive an envelope containing a booklet, the front page of which is an explanatory letter from Tracey Crouch MP and pages 2,3 and 4 being the letters / personal statements of the three applicants. 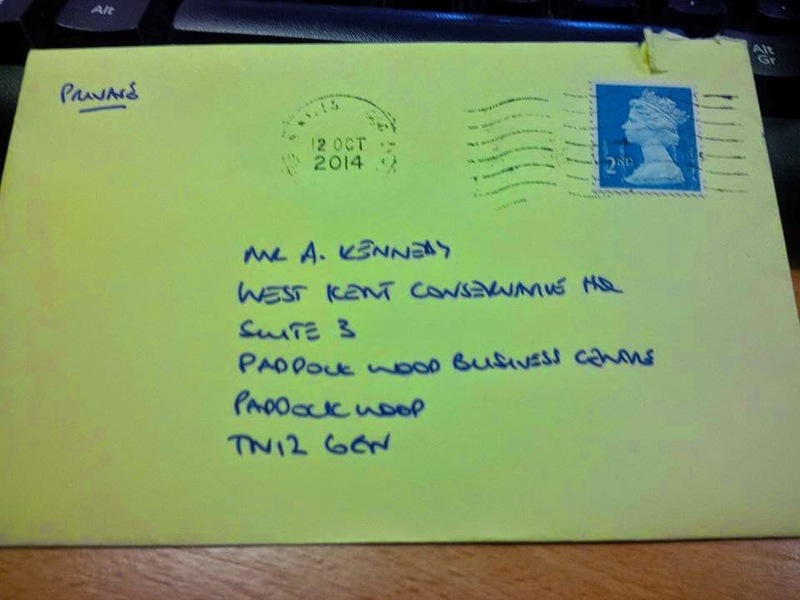 The envelope will also contain a ballot paper and reply envelope. The ballot paper will also include a section to offer help and support for the forthcoming election campaigns. Residents may also vote online by entering a unique reference number printed on their ballot paper. As always I will keep readers up to date on how it works out. Who is this charming man? Today's post brought a lovely card of thanks for the 'brief catch-up at conference' and for "introducing the me to (x), and for your kind words". Whoever sent this letter is very thoughtful and has lovely handwriting. Sadly, although it is signed (using a first name only) I have no idea who it is from. Nor, sadly, can I read the postmark. The writer refers to "reading my blog" so hopefully he might see this. If so, please email so I know who you are! It's not often people say I use "kind words" so I might as well make the most of it. By now both phones were ringing furiously. One third of the calls were people telling us what we already knew. Another third were people telling us their views on what we already knew. And the final third were people telling us what we should say if anyone asked us what we knew. It was amazing that the everyone seemed to have a view on something none of us knew was happening 30 minutes earlier. What we did know was that various TV news channels were by now aware that the Rochester & Strood Association Chairman was on a canal boat, knew the name of the boat (they had phoned the hire company) and also knew from my innocent Tweet that we were just 30 minutes outside Birmingham City Centre. A tip-off told us TV crews were waiting for us on the sharp bend by The Mailbox; an ideal spot to shout questions or even worse film a navigation horror as one of us fell in or crashed into the bank by over steering. I suggested that Andrew and I should stay inside the boat until we were fully briefed and left Steve and Nancy to steer. This worked well as both are experienced boaters, but did result in two absurdities. Firstly, Steve wasn't sure where our mooring was which resulted in me sitting out of sight on the engine room floor giving directions whilst peeping through Nancy Mackness's legs. Meanwhile, inside, Andrew was naturally curious to see what was happening outside and peeped through a slit in the curtains coming face to face with a Meridian News cameraman staring back. Both were so surprised to see each other than the camera man didn't get his shot! What followed of the coming hours and days must remain between those who have a need to know, but I remain hugely grateful to a small cadre of friends who were always there at the end of a long day of meetings and discussions, with a seat at their restaurant table and several large glasses of wine to help me relax. They know who they are. It was not all work, though I didn't actually see inside the main conference hall until the Prime Minister's speech on Wednesday. But here are some of my person non-political highlights from Birmingham 2014. The West Kent Reception: Now in it's fourth year and the best attended yet (apart from the five guests who for some strange reason went to the venue we used two years ago then complained they couldn't find us). 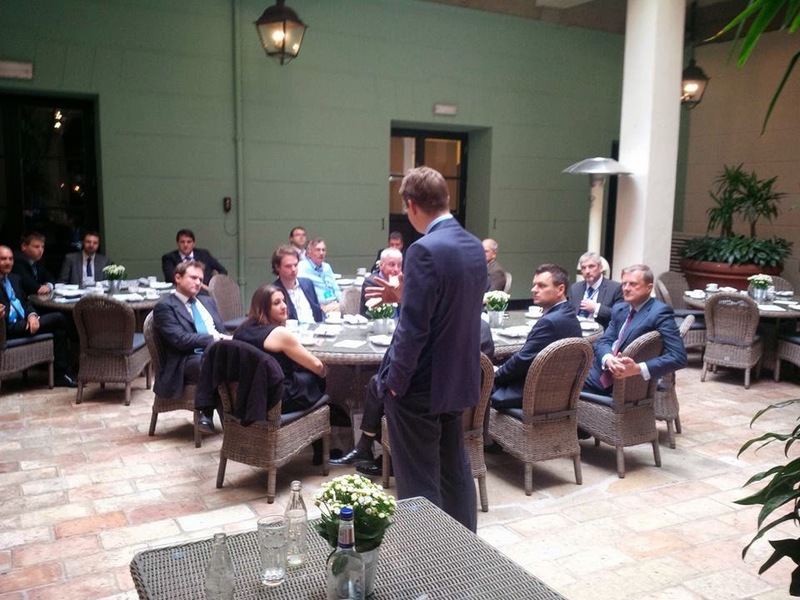 This year we were in the courtyard of Hotel du Vin and as well as a delicious tea we heard from Greg Clark MP, William Rutherford and National Vice President, Steve Bell. Finding a very quiet storeroom hidden away where I could work in peace, then returning late the following night to draft a letter which was being emailed to members only to find it occupied by two amorous CF-ers. I was thankful I hadn't arrived 10 minutes later, as I suspect were they! Being told the Regional Chairman would give me a name-check at the South East & London Regional Reception so people could collect a contact card from me to offer help with campaign support only to arrive and find myself locked out as the room was at capacity. I then heard through a firmly closed door, "Andrew Kennedy will be issuing contact details - give a waive Andrew....where is he, Andrew.....???" At the above reception finding many 'great and good' also excluded due to lack of space, including Sir Nicholas Soames MP and Vice President of the National Convention, Steve Bell - plus many others who accepted their fete without complaint. Then hearing the distinctive voice of a local County Councillor shouting at the security guard, "this is a disgrace, don't you know who I am?" I only wish the guard had replied, "your name is printed on your pass if you have forgotten." Finding myself at a breakfast table with Lord Ashcroft, Richard Ashworth MEP and Steve Bell and being asked to sing "Happy Birthday to You" to Theresa May. At 7.45am. Which was almost as odd as being in the lift at the Hyatt Regency and the lift stopping for a pink suited Christopher Biggins. I avoided the temptation to say "So far-e so goodie" (giving my age away). First of all - apologies for no blogging - it's been quite a week. I am starting to blog again, but if you are hoping for gossip, rumours or inside tidbits about the by-election, I am afraid you will be sadly disappointed. I have always blogged to share humour, good practice and Association gossip - but not to divulge information which could damage or hinder. So no matter how juicy, eye-widening or titillating, if it's about Rochester & Strood you will not read it here! So here is a recap of the last seven days (part two tomorrow). 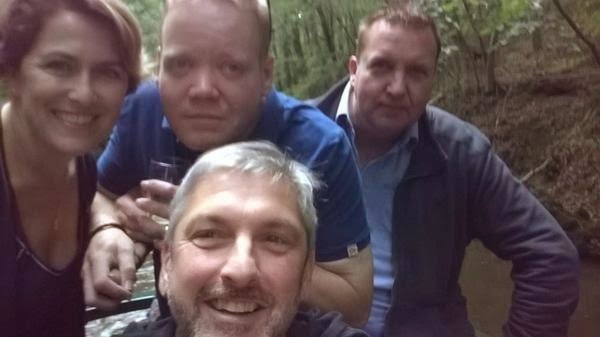 After two frantically busy conference seasons (in 2012 I was looking after our PCC candidate and in 2013 I was agent in an 18,000 majority seat about to select a candidate) I was looking forward to a quiet time catching-up with friends. Rather than book a hotel room we teamed-up with Rochester Association Chairman Andrew Mackness and his wife Nancy to hire a canalboat to sleep-on during the week. Even my long-suffering partner Steve joined us for the two pre-conference days between collecting the boat and arriving in Birmingham. In fact, here we are enjoying the autumn sunshine. Part of the journey along the Worcester & Birmingham canal is the magnificent Wast Hills Tunnel, 2.5km long and taking around 1 hour to travel. There is something very contemplative about being deep underground, in pitch darkness and with no modern communications. 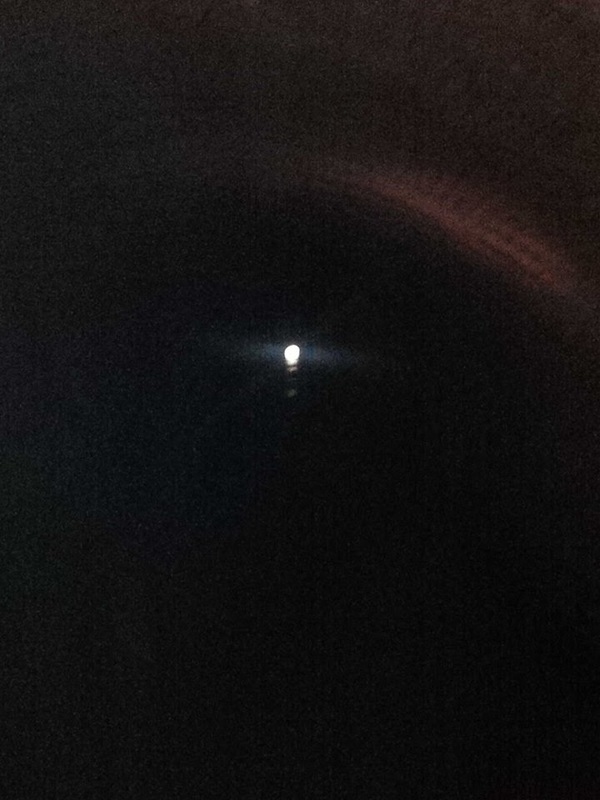 I was sitting at the front of the boat looking at the distant light and thinking through the year ahead. Steve, Nancy and Andrew were astern, Steve using the perfect acoustics to sing the Tenor's aria from Hendel's Messiah (beautifully). 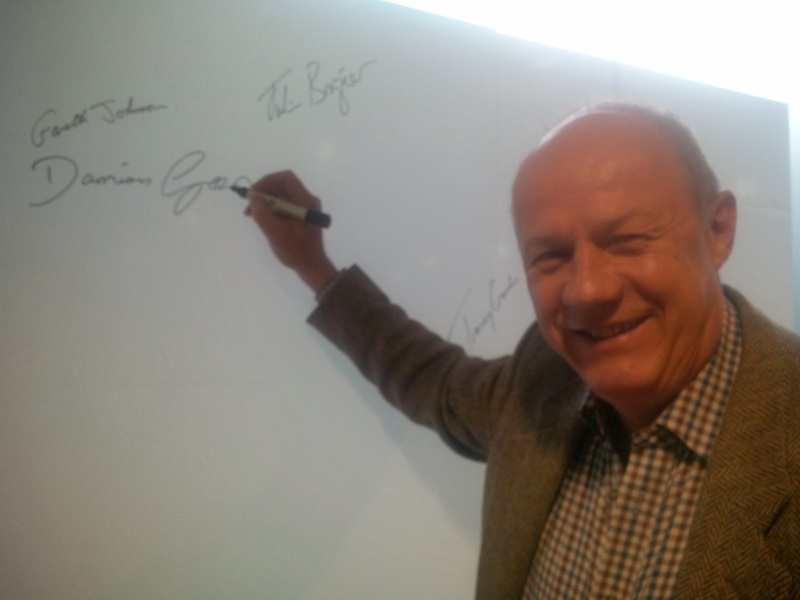 As we emerged into the Birmingham suburbs, Andrew Mackness came forward to join me and we talked through our plans for the Conservative Party in Kent and the forthcoming election. Suddenly as our phones reconnected with the modern world a cacophony of beeps and bloops indicated 22 missed calls and 17 texts. Andrew's phone was doing likewise, but with a different range of beeps. "I wonder what might have happened which has made us both so popular?" I asked, nervously, almost knowing that I probably didn't want to know the answer. As the reality sunk in all hopes of a quiet week drinking coffee with friends faded into oblivion. Alongside me, Andrew Mackness said "Oh dear, that's not very decent of him" (or something like that!) 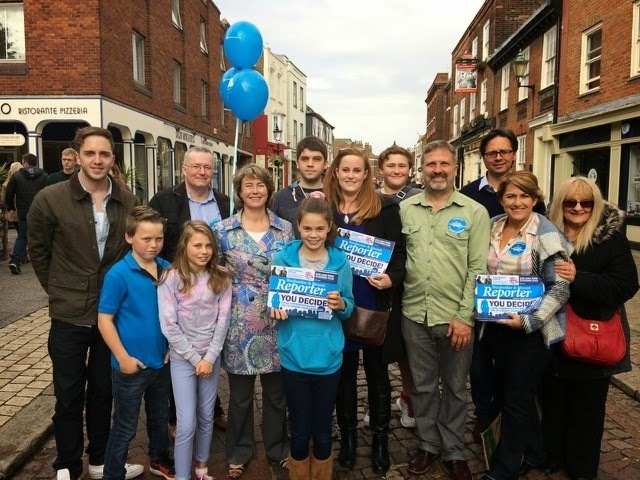 I immediately thought of just 18 hours earlier when I had bumped into Mark Reckless on Rochester High Street, as I often did. Conversation was never easy despite having known him for 10 years. For some reason he appeared to be dressed in a grey valour "onesie". "Hello Mark, how are you?" I enquired. He stared at me as if we had never met. "I am putting out the rubbish" he replied - looking at the black sack at his feet, before adding, "don't sniff it." Whilst contemplating why he would think I would wish to sniff his rubbish, he added, "It really doesn't smell very nice at all, it might have nappies in it." I didn't really know what to say, but thankfully he was on a roll and broke the awkward silence. "I've got two or three more sacks to bring out". He stood rigid, blinking at me. I was a bit lost for words at the absurdity of the conversation. "Do they all smell as bad as this one does?" I enquired. Another long pause, before he replied "I'm not sure, really." And with that he walked inside. I wondered if "it really doesn't smell very nice at all" was a euphemism for what he was about to do, or perhaps the entire conversation was a smokescreen to stop me asking him questions he would struggle to answer. Whatever the reason I knew my week catching up with long lost friends was about to change.